While in Nigeria, U.S. Secretary of Commerce Penny Pritzker participated in a roundtable discussion with representatives from General Electric (GE) Healthcare and the Government of Nigeria where she heard about what opportunities existed for U.S. companies to provide solutions to Nigeria’s health care issues, specifically in the areas of infant and maternal care. Before beginning the roundtable discussion, Secretary Pritzker was escorted by GE executives through a “Continuum of Care” walk through display which highlighted the many solutions GE is using to improve maternal and newborn health in the region. After the walk-through, Secretary Pritzker sat down for a roundtable discussion where she heard more about the formation and the recently signed Healthymagination Mother & Child initiative. This first-of-its-kind, 5-year initiative, signed by GE, Nigeria’s Ministry of Health and USAID, will focus on increasing capacity in the primary health care system and providing affordable financing options to support the reduction of preventable child-maternal mortality in Nigeria. Specifically, the imitative is focused on bringing more mobile and alternative powered health technology to the region along with robust training and education programs for nurses and midwives to help reduce child mortality and improve maternal health. Both of which will help Nigeria meet its Millennium Development goals. 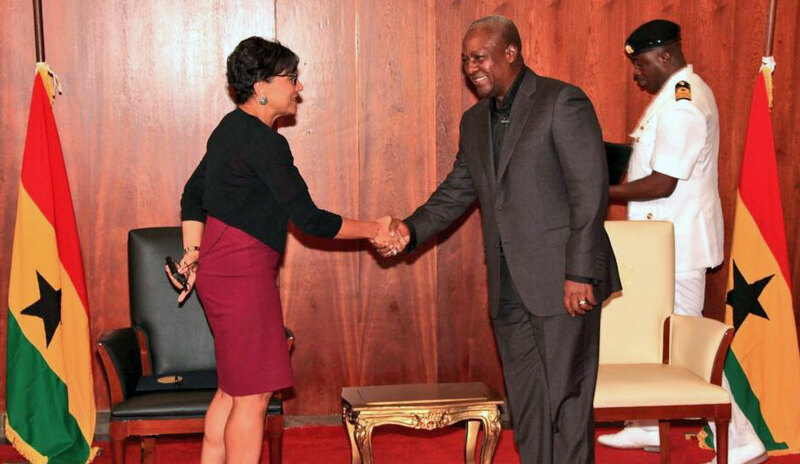 During the trade mission, Secretary Pritzker highlighted that U.S. businesses want to be in Africa. She discussed how American companies not only invest time and resources in countries like Nigeria, but they also make investments in the communities in which they operate as well. GE is an example of one such company that has not only been investing in infrastructure and power projects in Nigeria, but has also been actively involved in ways to improve healthcare outcomes and efficiency, including maternal and infant care.in Nigeria. 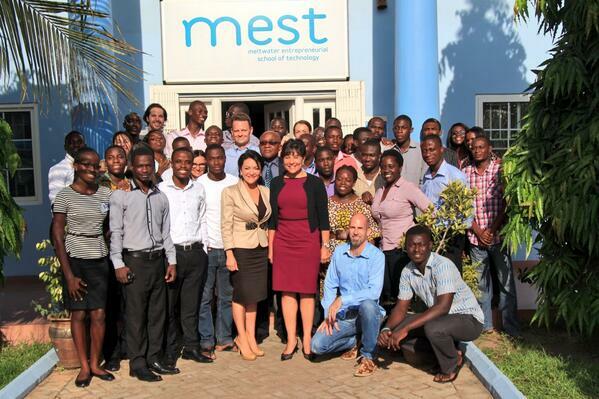 both through its corporate social responsibilities platform as well as furthering its commercial interests. .
After meeting with Ghanaian Minister of Trade and Industry Haruna Iddrisu and Minister of Finance Seth Terkper, U.S. Secretary of Commerce Penny Pritzker stopped by the Meltwater Entrepreneur School of Technology (MEST) to tour its facilities, interact with several of the resident start-ups, and gain more insight into the Ghanaian entrepreneurial culture. Established in 2009 and based in Ghana's capital city of Accra, MEST and its Incubator program provide training, investment and mentoring for aspiring technology entrepreneurs. 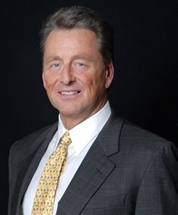 Its goal is to create globally successful companies that spur prosperity and jobs locally in Africa. MEST offers aspiring African entrepreneurs a fully-sponsored, two year intensive program to learn the skills necessary to build successful tech businesses, including computer programming, software development, product management, finance, marketing, sales and leadership best practices. The Department of Commerce supports entrepreneurship through its "Open for Business Agenda," a set of strategic priorities focused on data, innovation, and trade and investment. As the primary voice of business in the Administration, the Department produces policies and initiatives that help in the establishment and success of new start-ups as well as the growth and competitiveness of existing businesses. In April, President Obama and Secretary Pritzker announced the Presidential Ambassadors for Global Entrepreneurship (PAGE) initiative. PAGE - which is chaired by Secretary Pritzker - is comprised of 11 well-known, successful American business leaders who have committed to sharing their time, energy, ideas, and experience to help develop the next generation of entrepreneurs both at home and abroad. 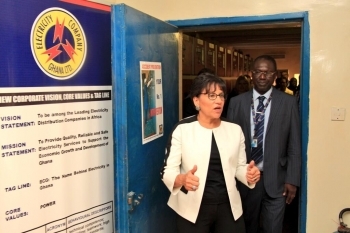 Today, Commerce Secretary Penny Pritzker kicked off her second day in Ghana at the Electric Company of Ghana (ECG) as part of the Commerce Department’s West Africa Energy Business Development Mission. During the site visit, she spoke about the strong relationship between Ghana and the United States and the importance of partnering with private sector businesses to help Ghana reach its energy potential. During the site visit, Secretary Pritzker specifically addressed the importance of the Administration’s Power Africa initiative and reiterated the U.S. commitment to improving economic prosperity in West Africa through investment in the energy sector. President Obama announced Power Africa last year as an initiative to double the number of people with access to power in Sub-Saharan Africa. With more than 600 million people in sub-Saharan Africa lacking access to reliable electricity, the power development challenge is enormous. More than two-thirds of the population is without electricity, including more than 85 percent of those living in rural areas. According to the International Energy Agency, sub-Saharan Africa needs more than $300 billion in investments to achieve universal electricity access by 2030 – far beyond the capacity of any traditional development program. As part of Power Africa, the United States will commit more than $7 billion in financial support over the next five years to this effort. The trade mission, Secretary Pritzker’s third since taking office last summer, will promote U.S. exports to Africa by helping U.S. companies’ launch or increase their business in the energy sector in West Africa. The firms joining the mission have the expertise to help African countries develop and manage energy resources and systems, as well as build out power generation, transmission, and distribution. Tomorrow, U.S. Secretary of Commerce Penny Pritzker will leave for West Africa to lead 20 American companies on an Energy Business Development Mission with stops in Ghana and Nigeria. This mission will promote U.S. exports to Africa by helping American firms launch or increase their business in the energy sector in West Africa. It will also help the African region develop and manage energy resources and systems, build out power generation and transmission, and distribution. Africa is home to seven of the ten fastest growing economies in the world, and helping U.S. business expand their presence in these African markets is a top priority for the Department of Commerce and the Obama Administration. There is tremendous potential for U.S. companies to sell their goods and services in countries like Ghana and Nigeria, which have energy needs that our firms have the goods, services, and expertise to address. Expanding trade and investment is a critical tool for economic growth and job creation in the U.S., and trade missions like this one are one way to help grow U.S. exports.